gotta love the Cupie on the peach/yellow shelf! I want to know if they buy books just for the color. All mine seem so drab, just black penguin classic or neutral brown spines. i need to get books where the cover is just as colorful as the inside apparently. I recognize it! It was on the Craft Zine blog a little while ago. wow! I loved this pic! It`s nice to arrange them by color but it must be hard to find the book later. a while back the artist chris cobb re-organized the entire adobe bookstore in san francisco. i am not sure if that photograph is from there or not. Yes, they are from a flickr stream that has been used in other locations. Also ran across them recently on Craft Zine blog, they are beautiful! so beautiful. Katie, i too have some drab book spines. i've been trying to do this but i have rows of black or neutral. and i can't split up my harry potters even though the colors vary. This is included in Domino Mag's 'reader homes' online gallery, where people can contribute photos through Flickr. This Flickr user 'chotda,' says she did take the idea from the Chris Cobb installation. It looks so great! If you are really motivated you can make covers for your books in various colors or prints. 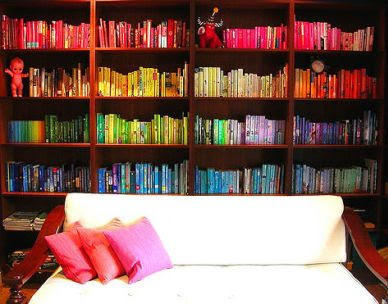 I am so in love with these color coded bookshelves. This is the worst part about living at school...no room to display all my books! I think I've seen it on The Style Files? I keep my books organized by color, but the majority have black or white spines, which detracts from the rainbow effect. How is it possible that the owner of this room owns no black or white books? Or do they have another room that is all black and white? The Laundromat Cafe in Copenhagen does the same. As Becky mentioned, it was featured on Style Files. (and they commonly use that pic for their masthead graphic). I wonder how they find a book when they need it? Maybe they just know what title goes with what color.